Part 1: New Zealand, Australia, Massachusetts, the New Deal, and China: How governments took an active role initially, and how they balance economic variability now. || This original research was produced for The Globalist Research Center and Arsenal For Democracy. More than 150 countries have set minimum wages by law, whether nationwide or by sector. Other countries have no legal minimum, or governments play a different role in wage setting processes. Where in the world did government-set minimum wages originate? In 1894, over 120 years ago, New Zealand became home to the first national law creating a government role for setting a minimum wage floor – although this may not have been the initial intention. The Industrial Conciliation and Arbitration Act established an arbitration court made up of both workers and employers. It was intended to resolve various industrial-labor relations disputes in a binding manner. The goal was to avoid all labor strikes. The court was empowered to set wages for entire classifications of workers as part of these resolutions. It did not take long for this to evolve into a patchwork of rulings that effectively covered all workers. Today, New Zealand’s hourly minimum wage is about equivalent in purchasing power parity (PPP-adjusted) terms to US$9.40. Which country first adopted a living wage? In the 1890s, neighboring Australia was still a loose collection of self-governing British colonies, rather than one country. One colony, Victoria, was inspired by New Zealand to adopt a similar board with wage-setting powers. This occurred shortly before the Australian colonies federated together in 1901 to become one country. In 1907, Australia pioneered what is now known as a “living” wage when the country’s new national arbitration court issued a ruling in favor of a nationwide minimum wage. That court specified that it had to be high enough to fund a worker’s “cost of living as a civilised being.” While the ruling soon ran into legal trouble from the federation’s Supreme Court, it remained a crucial precedent in future labor cases. To this day, Australia has a generous minimum wage. The current rate is about equal to US$11.20 in PPP-adjusted terms. This represents about 55% of median pay. However, New Zealand’s minimum wage is actually proportionally higher, at 60% of median pay. Which U.S. state had the first minimum wage? In the United States, a minimum wage mechanism was first introduced in 1912 at the state level — but specifically for female workers (and some child laborers) — in Massachusetts. The state passed a law to create a “Minimum Wage Commission” empowered to research women’s labor conditions and pay rates, and then to set living wages by decree. For any occupation, the Commission could set up a “wage board” comprising representatives of female workers (or child workers), employers, and the public to recommend fair pay levels. 1912, the year Massachusetts passed the law creating the commission, was part of a period of major reforms in the United States, which had become the world’s largest economy. These changes gave government a more active legal role in economic policy. In 1913, the country adopted the Sixteenth Amendment to the U.S. constitution, which made possible a federal progressive income tax. Also in 1913, the Federal Reserve System was created. There are op-ed columnists weeping about all the jobs a $15 wage floor would supposedly eliminate, as if companies couldn’t just cut executive pay and shareholder payouts. Some still insist that, to avoid spurring unemployment, it would be better to pay everyone less than they need to pay bills. I hate to break it to them, but the first goal of paid work is to get workers enough money to survive, not to give everyone something to do. But at any rate, there’s just so much evidence that reasonable minimum wages don’t cause mass unemployment (despite what those folks seem to think). Really, it’s all a matter of priorities. Wages are just part of the field conditions in which companies compete under a properly regulated capitalist market, along with taxes and supply costs and anything else you can imagine a company needing to pay for. We’ve decided not to properly regulate the labor market, so companies use money for other stuff (or profits), and not for wages. As FDR argued, if your business literally can’t operate without underpaying workers, it doesn’t deserve to operate. If higher wages for low-level workers is the breaking point for your company and no internal changes can save it, your company is a disaster. A properly regulated market would adhere to the principle of corporate survival of the fittest, but “fittest” would include ability to pay fair wages without bankruptcy. Small businesses wouldn’t go bust automatically either, because all workers would be getting paid more and thus have more to spend locally. Every so often, post-polio FDR made public appearances where he was standing or walking, with support — and in great pain. We know, for example, that his son helped walk him to the lectern in 1932 to become the first presidential candidate ever to accept the party’s nomination in person. But the above clip may be one of the few times captured on film — and possibly the largest number of people he ever walked in front of publicly. 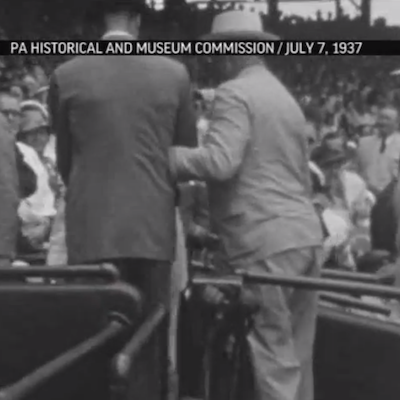 The 8mm footage comes from the personal collection of former Major League Baseball player Jimmie DeShong, who apparently filmed it himself at the 1937 All-Star Game in Washington D.C. The media rarely even showed the president’s wheelchair, let alone his agonizing walking, although he tended not to conceal it when interacting with people in person in small settings. The film has just been donated to the state of Pennsylvania. You can also see photos of his leg braces, wheelchair, and specially modified car — tools that he used to work with his disability — from the FDR Library website.